As I mentioned in the earlier post, in 1914, the neutral Belgium began to be occupied by Germany to protect itself from France. Soon 95% of Belgium was under Germany. France understood the gravity of the situation and joined hands with Britain and brought their troops to Ypres - the city in Belgium upto which Germany had occupied, to help the Belgian army, effectively beginning an international war, called the Great War, which is now being called First World War. In Ypres alone 5 wars were fought. Quite amusingly Ypres was never occupied by Germany. Ypres is surrounded by ridges and hills all around, in a shape of an arch / semi circle. A Salient in military terms is a portion of battlefield that protrudes into enemy territory. Ypres was projecting into German occupied Belgium and was protected by British, French and Canadian troops. Today a tour of the Salient line and visiting some memorials & cemeteries in Ypres is a typical way to explore Ypres. There are several tourist operators who organize the trips esp for one group with specific requests or multiple people together. I took the trip with Salient Tours and was guided by Mr.Lucas, a local, who began unofficially guiding at 11 yrs of age! Our first stop was Essex Farm Cemetery. 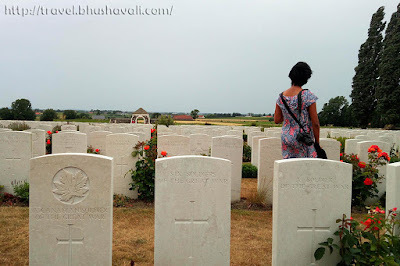 Before entering the cemetery, we first headed to the Advanced Dressing Station just beside it called Site John McCrae. This has a series of several rooms. Each room has 6 slots which were meant for 6 beds. This was originally a basic medical station. But during the 2nd Ypres War, Germans' modus operandi was gas attack which resulted in making this a full fledged medical care station. It was here that John McCrae, a surgeon, wrote the famous poem 'In Flanders Fields', in which he writes about his observance of poppies blooming in the war shocked land! Its because of this poem that till date poppies are a symbol of war remembrance. The Essex Farm Cemetery has 1204 burials of which 104 are unidentified. Originally the tomb stones were made of limestone however the ones that get damaged are nowadays being replaced with marble which is stronger. Some of the burials are closely packed next to each other called 'shoulder to shoulder burials' which means they died together and their individual bodies are inseparable. Unidentified soldiers were mentioned as 'A Soldier of the Great War'. One of the most important burials here is of Valentine Strudwick who was just 15 yrs old when he died here! All the cemeteries have a cemetery register near the central memorial or near the gate. This has a list of the soldiers who have been buried here and the exact location of each burial. This is to facilitate people who are here in search of certain graves, like their own forefather's! Every cemetery also has a central memorial for the unknown soldiers for the kith & kin to pay their respect. This was designed by Rudyard Kipling (yes, the same man who wrote Jungle Book), after his son John Kipling died in the war and his body not retrieved (though now its identified). Our next stop was Yorkshire Trench & Dugout. This has 3 patterns on the ground. One of the dugout, one trench of 1915 and another of 1917. One of the trenches is accessible today for visitors to walk through. The dugouts can be seen but cannot be accessed. Since the place had a high water level, the dugouts were constantly being filled up and had to be pumped out. Since being very close to enemy line the pumping couldn't be motorized to avoid noise. Also the dugouts have an inverted A shaped platform called A-Frames to keep the feet out of mud and are 10m below ground level. These trenches were made zigzag to reduce the impact of shockwaves. Our next stop was Langemark German cemetery. This has granite planks on the floor that mentions multiple names in each. This was the site of 10,143 soldiers. Later on in 1956-58, all the German graves from every other cemetery was transferred here and right at the centre is a communal grave of about 30000+ soldiers. Today this whole place has 44000+ German soldiers buried here. Next stop was The Brooding Soldier memorial for Canadian soldiers. The final stop was Tyne Cot War Graves Cemetery. This is the largest Commonwealth memorial of WWI. The central memorial is on top of 3 German pillboxes. It was designed by Sir Herbert Baker. Since it was pre-designed the bodies had to placed in pre-determined burials and the names were written in the headstones. Now, remember 'shoulder to shoulder burials'? In such cases, they were buried together and the head stone read '2 or 3 Soldiers of the Great War'. This has 11,965 burials of which 8,369 are unidentified. Enroute we also stopped at a gentleman's farm to understand what is Iron Harvest. The aftermath of the war has been the way of life for the people living there till date. The tractors of the farmers bring up bombs, grenades, rifles and even bodies!!! The people here know to spot what is dangerous and what isn't! They have codes to inform the authorities regarding what was found. Depending upon urgency its either cleared immediately or over the next collection. What sunk my heart was, in the midst of grenades and bullets was a shoe of a soldier with the soldier's toe intact, completely petrified, which was beyond shocking for me, but the locals were expression-less and its a part of their everyday life!!! P.S: I was invited by Ieper Tourism to experience the city and Salient Tours to experience their service for review purposes, however the opinions are my own and this post does not to advertise the product/service. This was such an interesting yet sad post at the same time. I find the history very interesting and the fact you can even walk through the trench that is still there is amazing. However, the statistics of the number of dead is just shocking and reminds us all of how terrible war is. So sad also to think of that 15 year old boy killed amongst all the other good and brave men, fighting a terrible war. A very moving post indeed and I'm sure you were moved as well by visiting this area. I really enjoyed reading your post. I am a big lover of learning history, and I focused in on the first half of 20th century at school and college. Visiting the key sites of Flanders has been an intention of mine for many many years, and your post reminds me that this is something I very much still want to do. Thank you. I’m familiar with the poem In Flanders Field but didn’t realize it referred to the poppies at Ypres Salient. So hard to believe that locals are still digging up remnants from the war so long ago. What an interesting connection to Rudyard Kipling, though a sad one. Gosh, I bet this was incredibly sobering to see. Especially when you saw the toe in the shoe! That would stop me in my tracks. But at the same time, it's so important we visit these places and remember what happened, and those who made the ultimate sacrifice. Not easy, but lest we forget. That would be have been powerful to be at the site where In Flanders Fields was written too. It is a beautiful phenomenon that people find such lovely places to rest in afterlife. Ypres itself looks like a quaint little place where one can stroll down in pages of history. War Graves Cemeteries always have this hunting feeling attached to it. You cannot help but ponder about the fate of the families these soldiers left behind. I like it that the country takes care of the cemeteries to keep the history alive, so today's generation can learn about war and its outcome. I found the Iron Harvest interesting and how people/farmers who live there know what to do when they found remnants of the war. I wonder if people who live in the same condition in the other part of the worlds do the same. Though the place is quite eerie, this is something that keeps a good reminder about the past. Thanks for virtually touring us! So they don't accept new tenants here? A very heart felt post one which is full of history and sorrows. It’s s great post remembering some of the brave. It looks so peaceful and calming The one which touches me the most are the Tyne Cot wat graves with its uniformity and past. Thanks for sharing a less know part of Belgium. I have never of Ypres but I’m so glad I came across your post. There is so much to learn for all of us when we visit the places you mentioned above. It is so heart wrenching to read about the hardships of those times. Thanks for the share! I have a weird interest in cemeteries. Somehow, they are different in all the countries and tell a lot about the cultures. You should take a look at ones in Russia, they hold a lot military things. I am glad you are sharing this kind of places, often forgoten. History and heritage which is important and we tend to go to places with stunning beach and views instead. Thank you for sharing this. It looks like a good place to explore for history buffs. Nice article, a lot of interesting information about which I did not know before.